Ian Hember is an archaeologist and historian living in Ottawa, Ontario, Canada. He has a fine appreciation for scotch, a passion for experimentation, and a fetching formica table. He may also be found at ian.hember.name. You can e-mail him here. What you see in this photo is not in fact a giant glass of whisky. 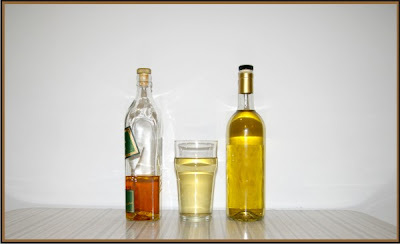 It is not white wine, sherry or juice. It isn't a surprise that the water would take on some of the qualities of the cask it has sat in for 3 days, but the difference in colour is rather more pronounced than I expected. And the smell! It smells like a cold fireplace. Like burnt wood. Like matches without the sulphur. It smells, then, rather like the smokiness of a good whisky. I had been led to believe that much of the smoke in a whisky comes from the peat over which the malt is dried. From this glass of water, it's very clear that smoke comes quite a bit from the cask as well. 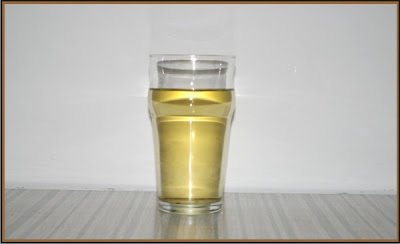 It's also clear that I can expect some significant changes in the colour of the whisky which will sit in the cask for 20-30 times longer than the water did. As for the smokiness, I am now exceedingly curious to see how well it will integrate with the sherry I'm about to pour in. With the excessive sweet fruitiness of the sherry and the predominant smokiness of the water, I fear that the sherry will be utterly awful when it comes out. But who knows? Here's a photo of the water between a Johnnie Walker Green and the Whisky Works bottles for comparison. At this point, there's nothing left to do but pour in the sherry and wait a couple of weeks for magic - or at least science - to happen.